Fresh from completing work on the Horfield Skatepark project, me and my mate went and did this collaborative piece down at the Project 360 Festival in the centre of Bristol. Project 360 is a two-day extravaganza featuring some of Britain's best urban artists and urban sports people. There was loads of people skating, breaking and all sorts going on when we got there. We decided to kind of stick with the dark theme of the skate park and did a Tree with Crows in on a blood red sky background. 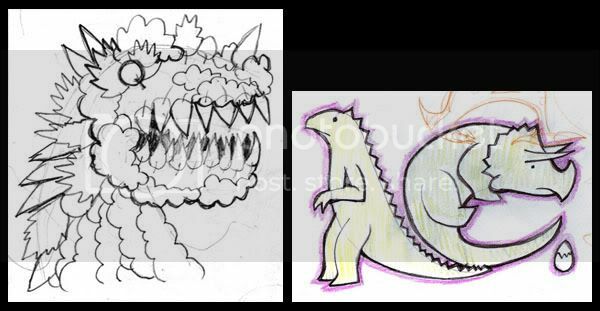 The tree shape is kind of based around the shape of a Triceratops skull with Crows where the eyes and nose would be. Faded out the background in a kind of bloodshot eye effect where it goes to white around other persons piece. Was good fun, if rather tiring, going on an all day painting mission. Other artists painting down there included - Paris, FLX, Feek, Yaka, Cheo, Hine and Dan. 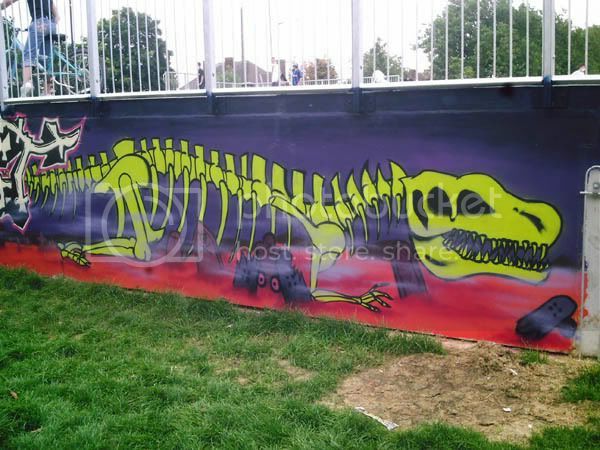 Here's some more pics from the skate park Graffiti project me and my mate did with young people in Horfield, Bristol UK. Thought I would go for a dino skeleton this time. We were going for a kind of Horror movie, Nightmare Before Christmas vibe. It's set in a kind of Graveyard with Tomb Stones and broken skate decks. Here's the piece with my mates 'The Graveyard Shift' piece. 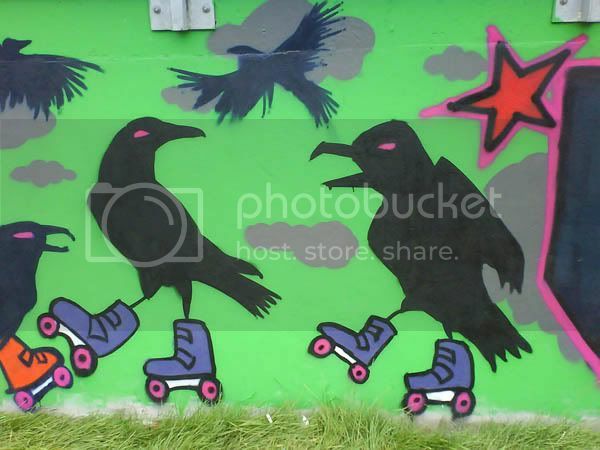 Also did these Rollerblading Crows with the kids, sticking with the spooky theme. They proved quite popular. There are lots of Crows round this way on the common. All in all the project went really well and there are some really artistically talented young people who skate there. I'm currently painting my local Skatepark in Horfield, Bristol with my mate and some of the kids that skate there. 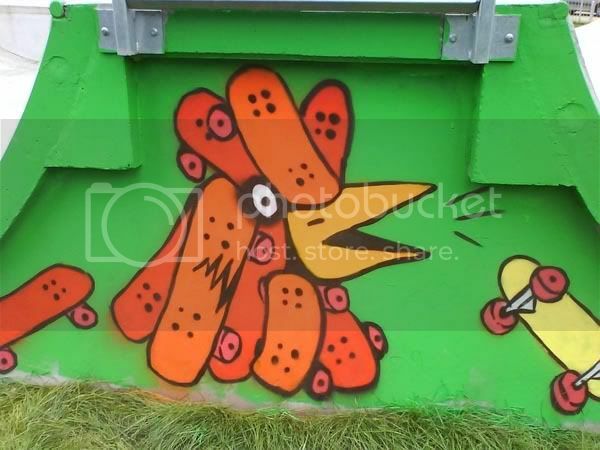 Will be posting a load of pics soon when it is finished, but thought that I would quickly stick this one up - Skateboard Chicken Head! Yes Alan - I did stick this pic up on my blog at the end of the day like you said I would. 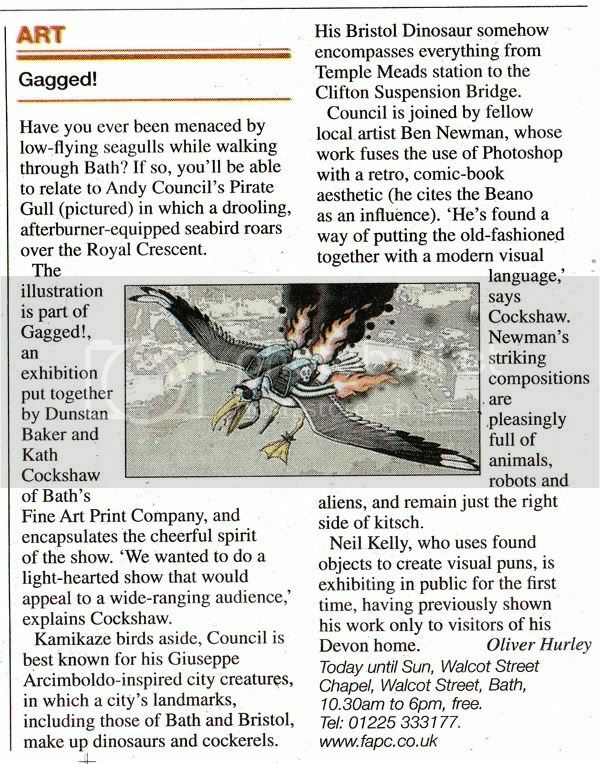 Yers some local press stuff for my latest show with Ben Newman and Neil Kelly 'Gagged' in Bath, UK. 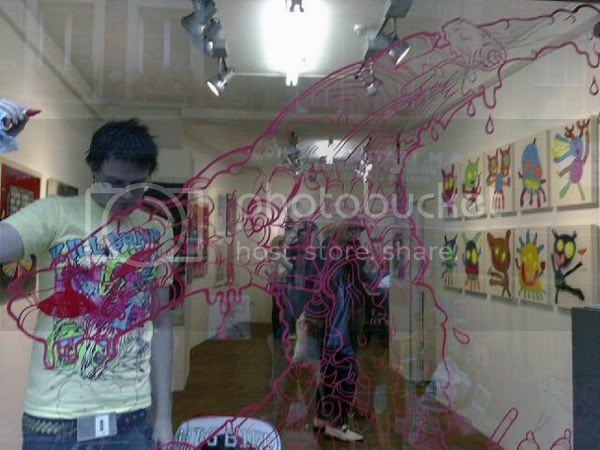 Last Sunday (17th August) I was at the Brick Lane Gallery London where I did one of my window drawings. It was part of their Free For Wall Street Art exhibition which I was part of. 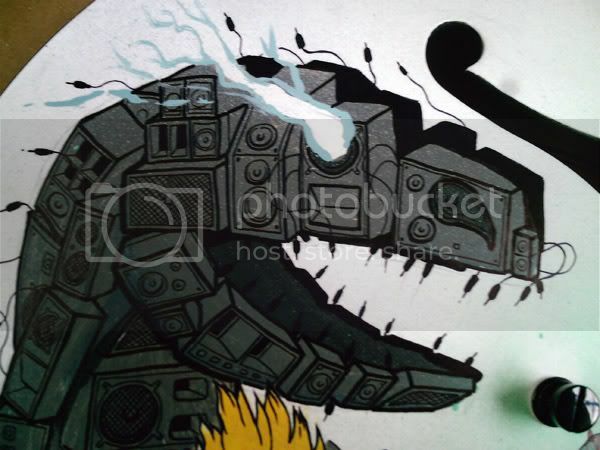 The dinosaur I drew was made up of Spraypaint and other tools of the trade of a Street Artist. 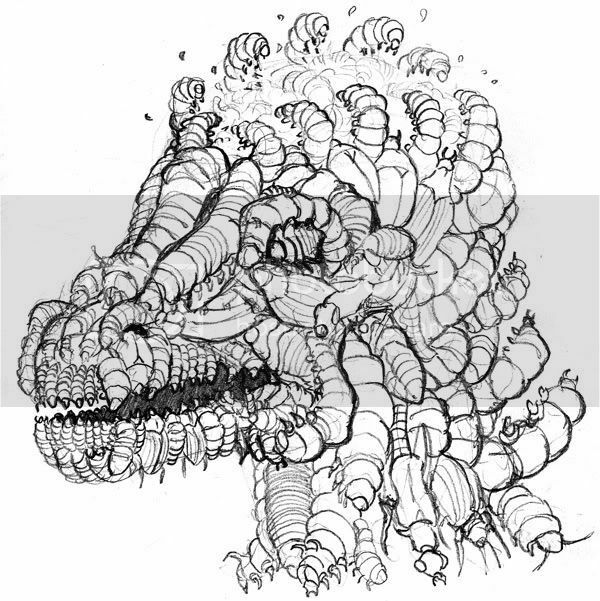 It was based on the plant eating Parasaurolophus. 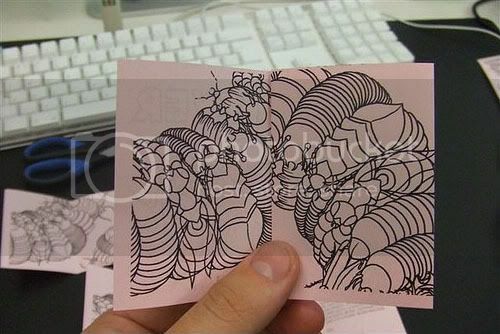 Here's the drawing I was working from and me doing the window drawing. Will see if I can find some better photos of the piece soon. The day went well. It was very busy with the Sunday market going on too so lots of people passed by and stopped to look and take pics. Thought I would stick this youth club mural up as turned out quite good. 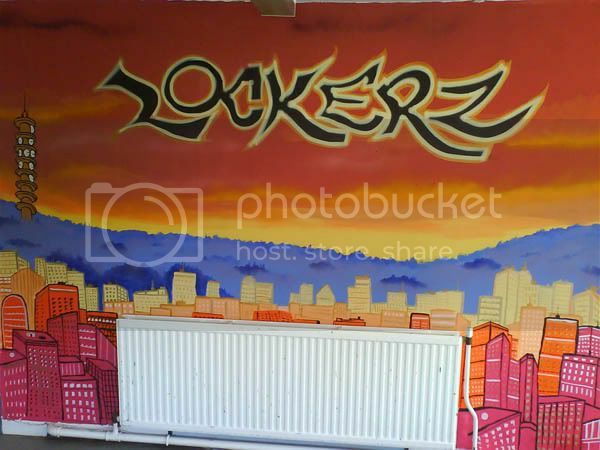 Was a piece me and my mate Alan did with the help of young people at a Youth Club in the Lockleaze area of Bristol. The BT TV tower to the left of the piece is a major landmark of the area. We put lots of made up sky scrapers in so it's a bit like Lockleaze in 2048 or something. Decided to put some writing up in the sky shortening Lockleaze to 'Lockerz' as some of the locals call it. Lots of gold used in this piece - I'm really into metalic paints at the moment. Yet another of my Acrylic/Spraypaint dino head pieces. This is very similar to the shutter piece I did a while back on Gloucester Road in Bristol but with a more Autumnal feel. Lot's of bronzes and golds used in this. Bits of overspray in places, but want to keep it quite loose. This piece and the other ones I have done so far like it are for sale. Contact me at andrew.council@gmail.com if you are interested. Here's another one of my experimental acrylic and spraypaint pieces. This tree based dino has a few houses in it, like some kind of alpine village and a tower in one of the spikes. 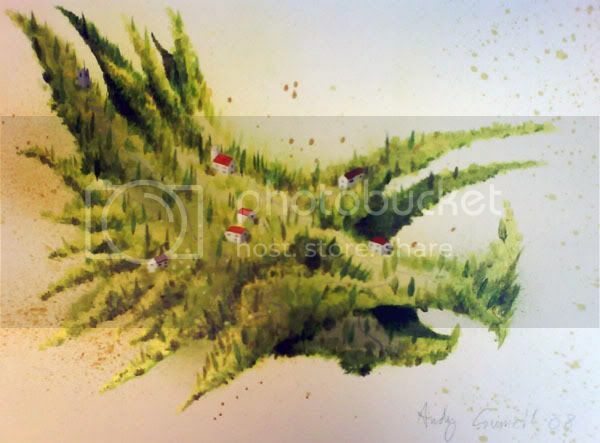 There is a bit of goldish green in this piece too which is quite nice but unfortunately doesn't show up in this pic. 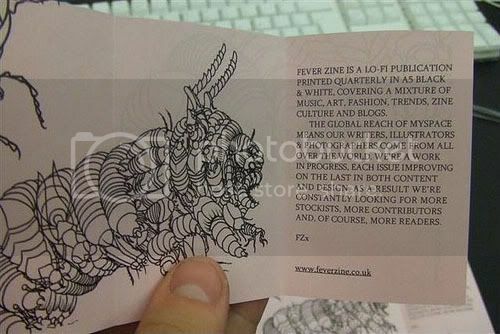 Way back in January I did some live drawing at the first Weapon of Choice night in Bristol along with FLX. There were a few bands on stage with us, one of which was Anomaly. 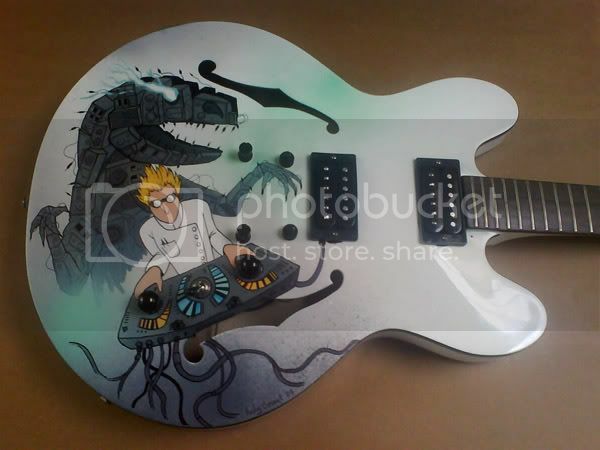 The guitarist Dr Jazz Tap asked me to customize his guitar. Finally I have done it - 8 months later! 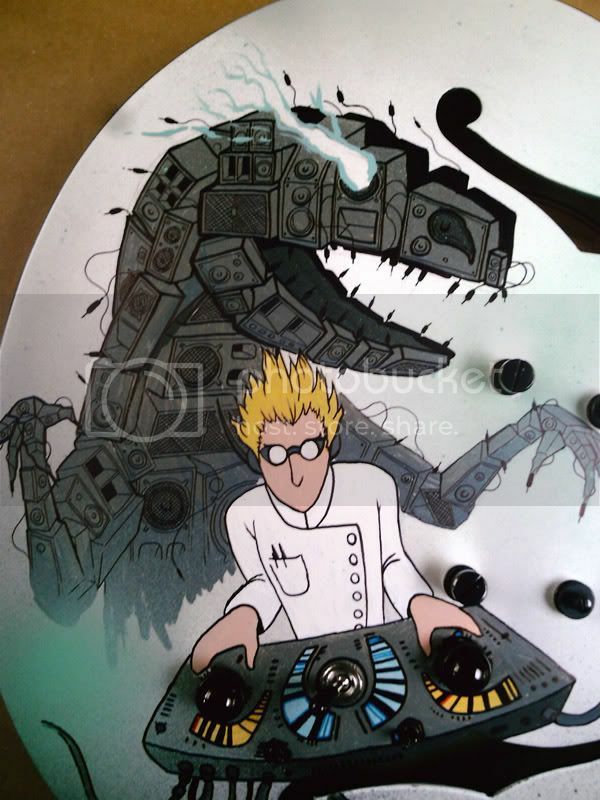 The design features one of my dinos made of speakers and a mad scientist controlling it. 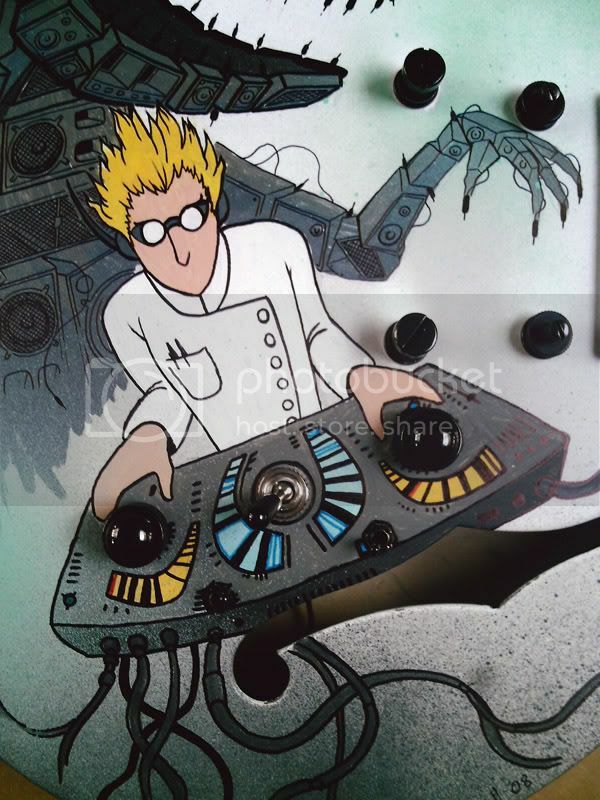 The scientist is similar to ones in the student film I helped make years ago 'Science Lab'. Really pleased with how this came out in the end! 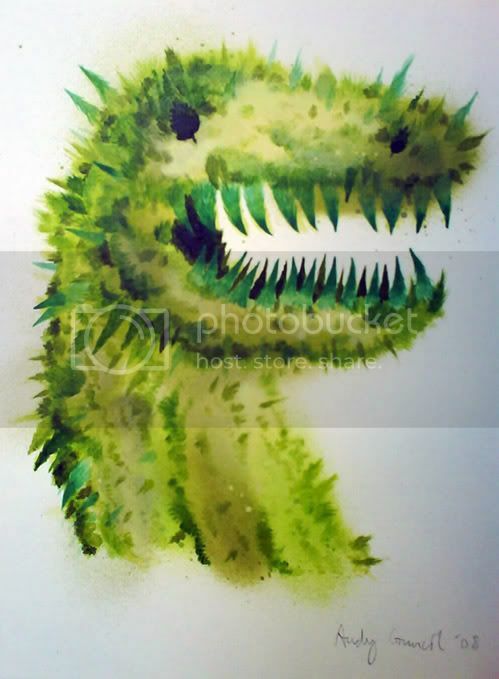 I knocked this up the other day - a T Rex head made up of trees done using Acrylic and Spraypaint on paper. Nice and quick for me too which was very refreshing. Will be trying a few more of these loose type of pics in my spare moments. Caterpillars seem to be quite popular at the moment. 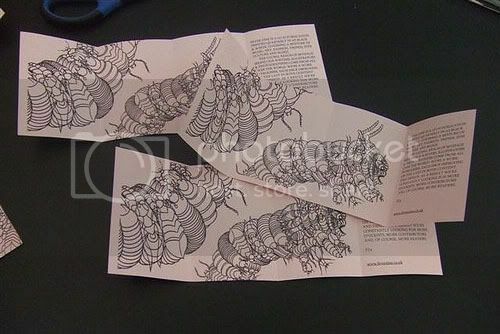 Following on from my recent Tree Caterpillar illustration is this beastie made up of lots of different bugs. It's a bit gross but kinda rad at the same time. 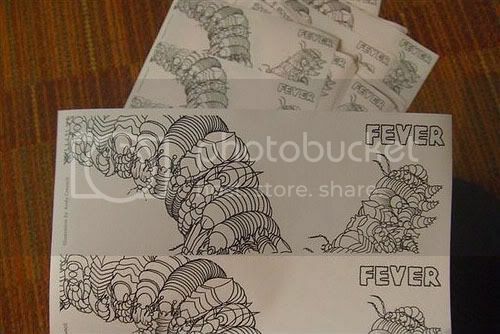 It was for Fever's mini Zine sandwiches that were on sale at the V&A village Fete. Here's some production pics. More can be seen here. 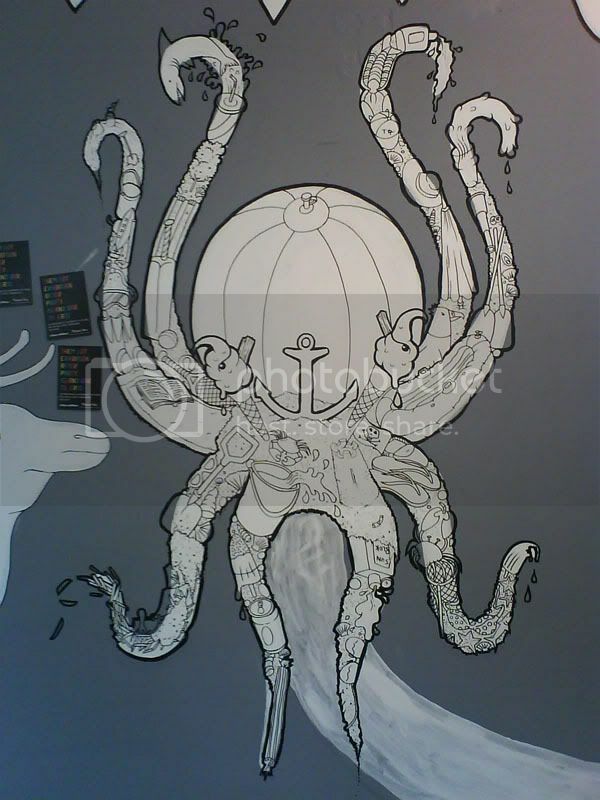 I have just got back from a flying visit to Birmingham where I added my Seaside Octopus to a collaborative mural in Urban Outfitters with the Them Lot collective. THEMLOT and Urban Outfitters have teamed up and will be presenting the newest works from the Art Collective THEMLOT. The opening will include live painting inside the store, and an after party to be announced. Where: Urban Outfitters in Birmingham, UK : 5 Corporation street in the city center. THEMLOT is a collective of artists hailing from Bristol to Birmingham. Gathered and put together by James Bourne. Within the collective you will find examples of illustration, photography, fine art, filmmakers, muralists and monster makers. 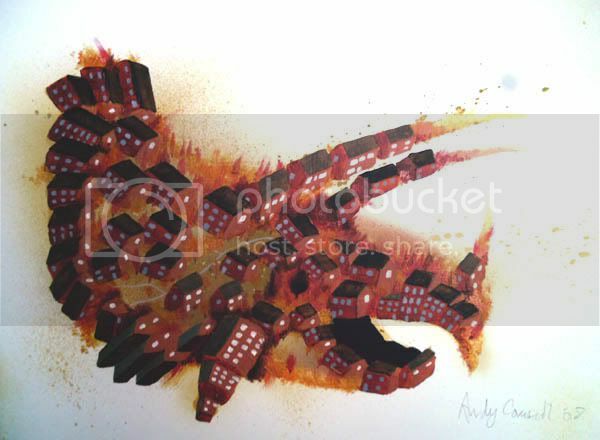 14 different artist featured on their website, representing a wide range or works and styles. They are James Bourne, Katie Mallon, David Shillinglaw, Andy Council, Joanne Conlon, Mark Long, Gareth Barnett, Oda Valle, Paul Roberts, Joel Peers, Bot Notley, Daniel Noon, Laurie Richardson and Nathan Chan. "Our new city history museum will tell the fascinating story of Bristol through many people's voices and experiences. 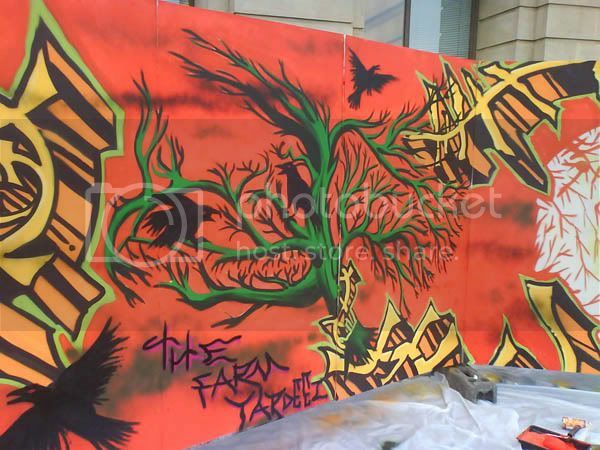 This artwork you see here on the hoardings has been created by a group of young Bristolians who have painted their perfect Bristol. They have worked closely with Museum staff to create images which they hope will become a real talking point. The young artists are all part of a Gallery 37 Plus project which seeks to engage young people in the arts, giving them te opportunity to learn new artistic skills and to develop existing talents. 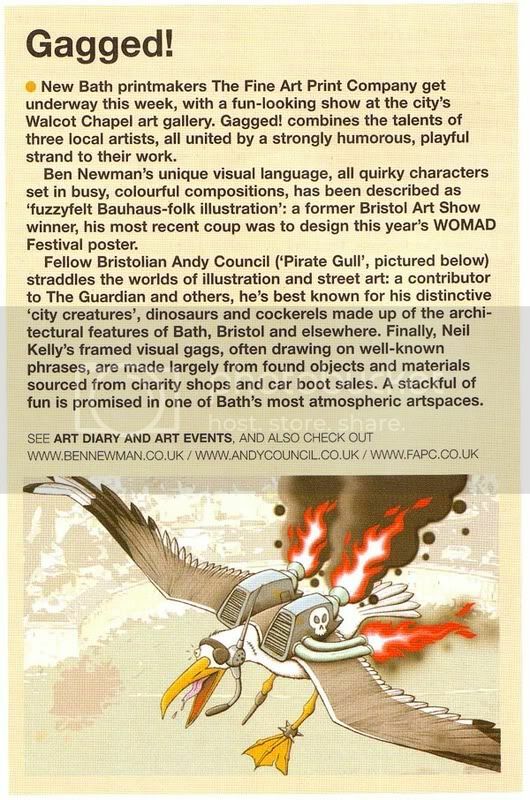 They have been helped by two Bristol artists - Andy Council and Daniele Delmonte. Working with the young people on the artwork is part of the new museum's commitment to work with many people across Bristol to develop a museum for everyone to enjoy. 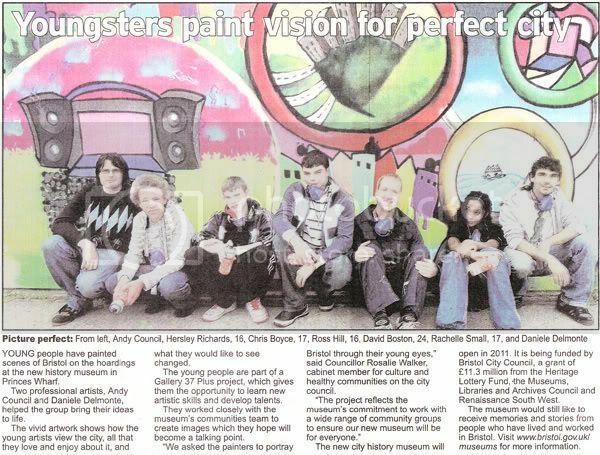 For more informaiton on Gallery 37 Plus see www.youthmusic.org.uk "
There is a pic of the piece here and here's the feature that Bristol Evening Post did! I haven't had too much time to do my own work of late as the course was full time and I was helping the Young People as much as I could with their design work. I did learn quite a few things myself along the way and got in plenty of practice with spraypaint. I did come up with a couple of sketches while doing the project that I might get up on a wall when I have time in the future. The dino lettering was inspired by guest speaker FLX's expert teaching. Do excuse the crap title to this post - had to do it. I recently went to WOMAD where I helped to run Graffiti workshops for young people with DAN and 3RD EYE. It was boiling hot and the demand was high from kids wanting to have a go with the spraypaint. It was pretty hard going but good fun too. 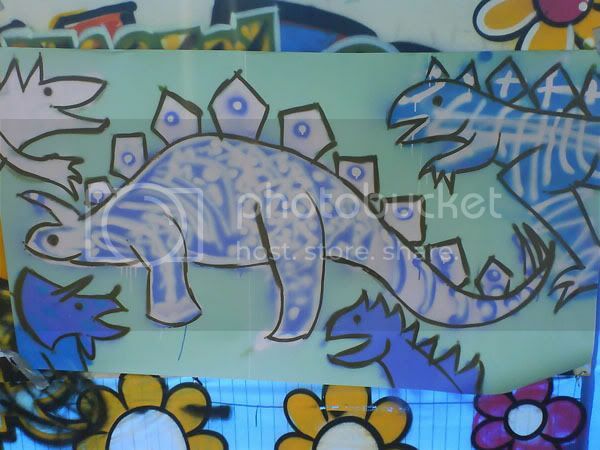 This dinosaur piece that the kids helped me to colour was my favourite from the weekend. Here's a couple of examples of text work I did a while back for various clients. 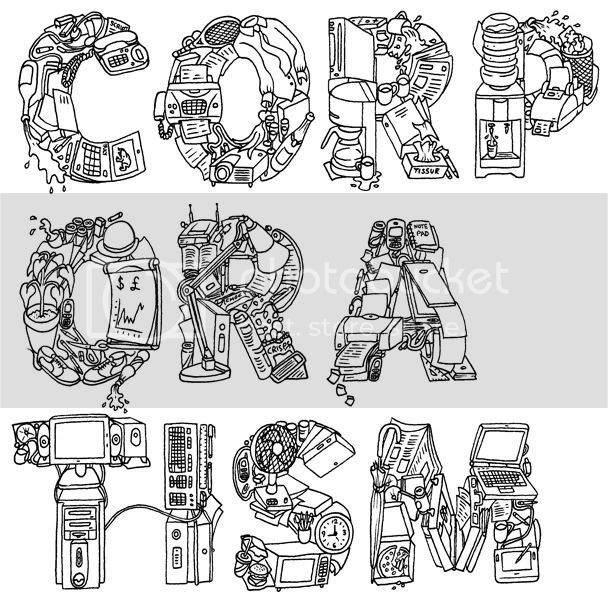 The lettering in each piece of work is made up of lots of objects that relate in someway to the text. This one you may have seen already a while ago. 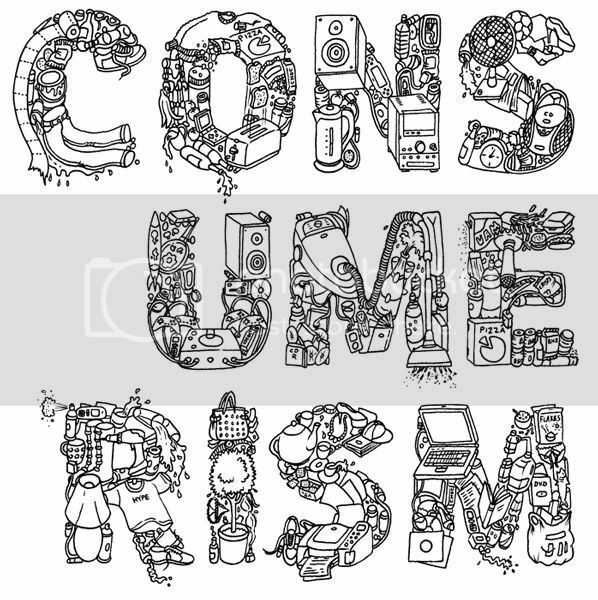 I it did for the Big Issue for a feature on Consumerism and Corporatism. I think it works the best out of the bunch - bigger letters to put all the little objects in. 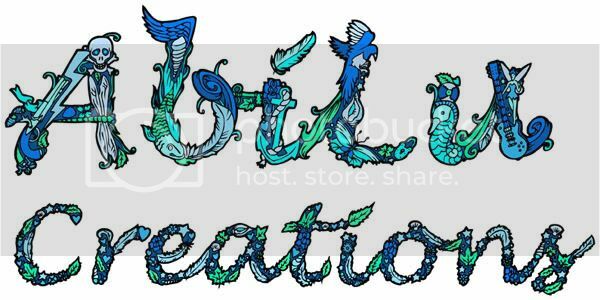 This a logo I did for my friend Abi who sells hand made, unique jewellery and accessories that have a vintage rock feel. The objects that make up the lettering are similar to the jewellery that she makes. This final piece of work is a sketch that I did for a window drawing piece that was filmed as an intro sequence for a short film about Graffiti. 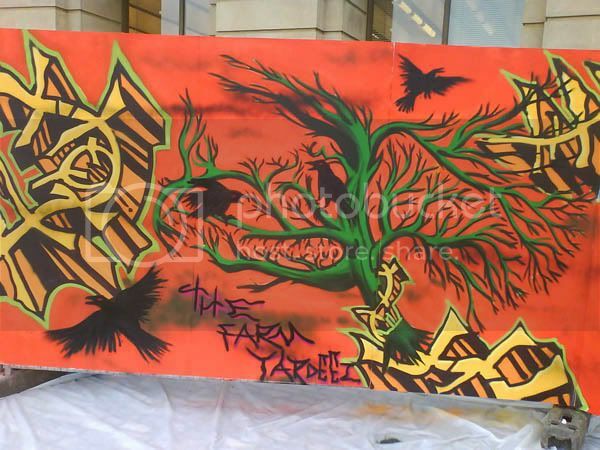 The film featured the work of different Street Artists including Sick Boy and Inkie and was narrated by Goldie. I think the piece is OK, but to be honest with you I don't understand why they didn't get a proper Writer to do it. I still haven't seen the whole film - when it was on ITV I was in a caravan in Wales with no reception!